and a bounty hunter from another world. Long, loud, and often trying on the nerves – Michael Bay (as now the second highest-grossing filmmaker of all time) is at it again, making the mess he loves to make with Transformers – apparently with himself in mind as his own audience. But this time, with a new and more effective cast and a more streamlined story, it irks me to say that Bay’s badness seems to be descending from its climax. Whereas the first movies tore holes in the souls of viewers from violently convulsing screenshots and intelligence-insulting characters, this one seems more concerned with adding some credibility to an otherwise repugnant CGI suckfest of a franchise. With Mark Walhberg, Kelsey Grammer and Nicola Peltz at least attempting to reach audiences in ways that the previous casts could not, hope soon appears on the horizon, if only for a while. There is still the oafish humor to contend with, but it also gets a refit in a movie that somehow doesn’t seem as bad as its predecessors. Is it a combination of Walhberg’s charisma and role versatility with the more rugged power dynamic of Optimus Prime renouncing allegiance to humans that somehow shakes loose the inanity of Bay’s new baby? Or is it the toying with a whole new idea about the origins of the great extinction on earth 65,000,000 years ago? Who’s to say. Regardless, onlookers may be surprised at how meaningful human connections are made in a plot that threatens to do the unthinkable by making us care. And if the term “Galvatron” means anything to you, then this is definitely one to consider opening up to. But bear in mind that those who love the previous films will tend to hate this one. 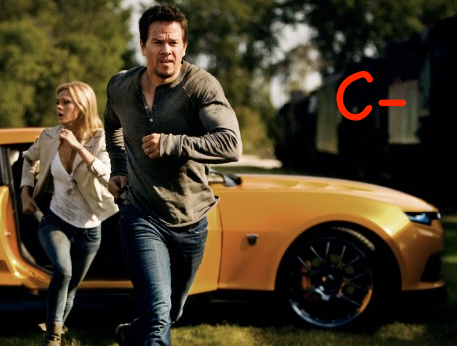 No, it can’t salvage itself, but Age of Extinction may be the best movie of them all thus far. I still say, how about we make extinct Bay's Transformers series forever?